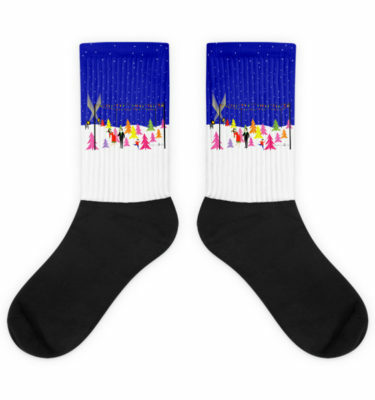 This Retro Family Trimming the Christmas Tree Black Foot Socks contains every holiday tradition but the fruitcake. A 1960’s cartoon family is at home in their mid century modern living room. 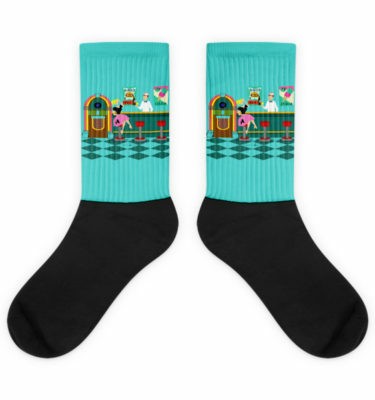 There is a turquoise and teal brick wall and a red, cone fireplace with a roaring fire. Dad is wearing a black suit and red tie. He is hanging green Christmas stockings on the mod chimney with care. Next to dad, Junior is perched precariously on an orange chair. Whoa! Easy there, Junior! He is reaching out to put an ornament on a kitchy, pink, Christmas tree that is already decked out with teal ornaments and a yellow star. On the opposite side of the tree, Mom is holding a festively wrapped present. Hey, no shaking allowed! Mom is wearing a bright red wiggle dress with white trim. She is also wearing a Santa hat. Beneath the tree, there is a sleek black cat wearing a red bow. On the floor, there is a green and black record player surrounded by colorful vinyl albums. 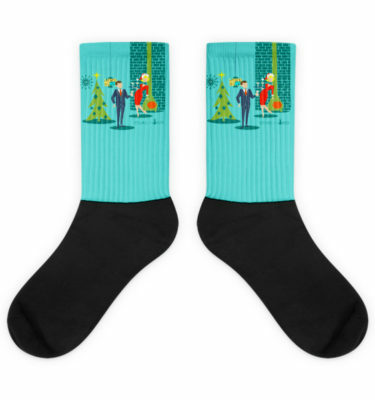 You just know that the family is singing along with their favorite Christmas carols while they are decking the halls. 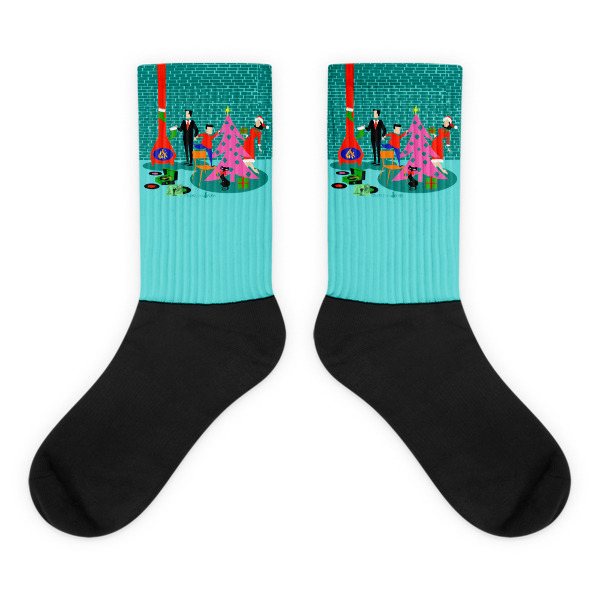 These socks will give you maximum comfort and style simultaneously! The top of the sock is printed, the bottom portion is solid black, and each sock is printed individually in the USA.